For a friend’s reunion, we were once again looking for a central location for Vancouverites as well as suburbaners. So here we were at Browns Socialhouse in the Brewery District in New Westminster, close to the Sapperton skytrain station. On Mondays, their drink special is $2 off mojitos. 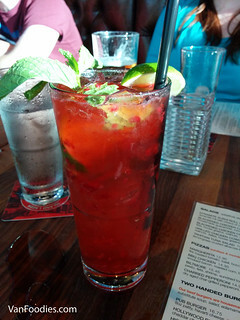 Between the traditional and raspberry, I opted for the Raspberry Mojito. It was in a pretty pink hue, with fruity flavour from the muddled raspberries. The drink is a 2oz pour so you can definitely taste the alcohol. Very good choice for a hot summer day. As for food, Mr. ordered the Hickory Burger. He has been craving for a really good burger for several weeks now. Even though The Burger Joint at the Food Cart Fest satisfied his craving, he still felt like more! 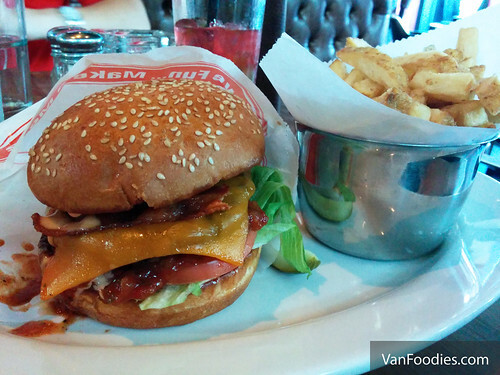 The patty was juicy enough, and the brioche bun was the perfect companion. However there wasn’t much smokiness from the BBQ sauce or the bacon. It wasn’t special enough to be a truly amazing burger. The fries are the usual affair from Browns (HCDC, which apparently stands for “Hand Cut, Double Cooked”), which are damn good. 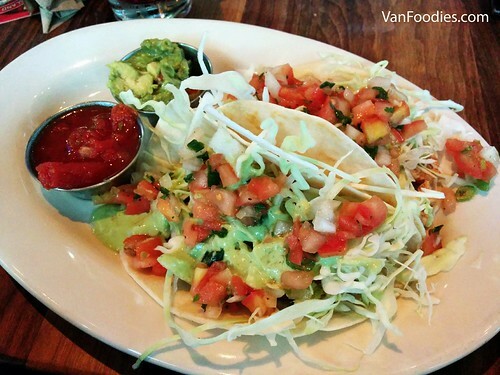 For me, trying to eat lighter, I ordered two tacos. Their Street Tacos come with 3 flavours. Each order includes 2 tacos and to my surprise, you don’t have to order 2 of the same kind. Therefore, I picked a Spicy Shrimp and a Chipotle Chicken and Lime, with guacamole on the side for an extra $1 (it’s almost a crime that guacamole is not included!). The tacos were of decent size, and topped with pico de gallo and jalapeno ranch dressing, adding some heat to the tacos which I liked. I wish there’s more of the actual filling (i.e. shrimp & chicken) but the flavours were very good. If this didn’t look like a lot of food, you could make it a Taco Combo, which includes two tacos, Mexican black beans and tomato cumin rice. It was a Monday evening and the restaurant wasn’t overly busy, but for some reason our server didn’t seem to be very attentive. She would walk by us without making any eye contact, missing the cue that we needed her assistance. She also mixed up a couple of bills when we were on our way out – not easy though, as we all asked for separate bills. She must have had a bad day. As a chain restaurant, I thought Browns is a solid option for those who want to hang out with friends over some food and drinks. A good selection of menu items that are priced comparably to other chain restaurants. The Brewery District location is actually quite nice with a huge patio. And it’s pretty close to a skytrain station. Not bad for a hangout spot. Bry and I haven’t had a chance to check out the brewery district…terrible I know! But we totally want to! It looks nice driving past. Thanks for the review! Hopefully next time you get a little more Hickory taste in your burger and the top-notch service we strive for.